Dr. Sandusky joins Northern Virginia Radiology Consultants as a board certified diagnostic radiologist with additional subspecialty training in musculoskeletal radiology. After receiving his undergraduate degree with honors in Cell Biology and Biochemistry from Bucknell University, he earned his medical degree at Temple University School of Medicine where he was inducted into Alpha Omega Alpha (the national medical honor society). Following an internship at Reading Hospital, he completed a 4 year diagnostic radiology residency at Rhode Island Hospital / Brown University. Dr. Sandusky went on to complete an ACGME accredited fellowship program in musculoskeletal radiology at the Hospital of the University of Pennsylvania. There he interpreted musculoskeletal MRI exams including MR arthrography, performed joint injections / aspirations and bone and soft tissue biopsies, and conducted interdisciplinary conferences among radiologists, orthopedic surgeons, and rheumatologists. His subspecialized focus on musculoskeletal pathology was supplemented with additional training in the interpretation of body MRI. 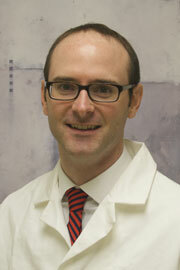 His specialty interests include the evaluation of sport and athletic injuries with MRI and MR arthrography. Dr. Sandusky resides in Arlington, VA. He enjoys outdoor recreational activities, traveling, and music, having dabbled in guitar, bass, and drums with various musical groups.